The Washington Post doesn’t mince words when it comes to Paul Ryan’s failure as Speaker of the House. Republican Rep. Paul Ryan of Wisconsin announced that he would not be seeking re-election in 2018, opting to continue to serve in his role as Speaker of the House until his term expires. However, to many, that may not be soon enough, as he seems to have already lost control of the House of Representatives. Ryan lost on Friday. He lost a high-profile vote on one of his “legacy” projects, the latest farm bill, which would have imposed additional work requirements on food stamp recipients. The decision to pursue those “welfare” cuts had lost him all Democratic and many moderate Republican votes from the outset. His lost authority on the issue of immigration, meanwhile, had led many of those same moderates—and a host of others—to circumvent him in an effort to force votes on immigration bills. The Freedom Caucus, which takes pride in its ability to procedurally out-crazy all other blocs, killed the farm bill after not getting its own, hard-line immigration demands to counter the moderates. With moderate and far-right Republicans opposing Ryan, the speaker stood in the back of the chamber when his farm bill went down on Friday, lost to himself. 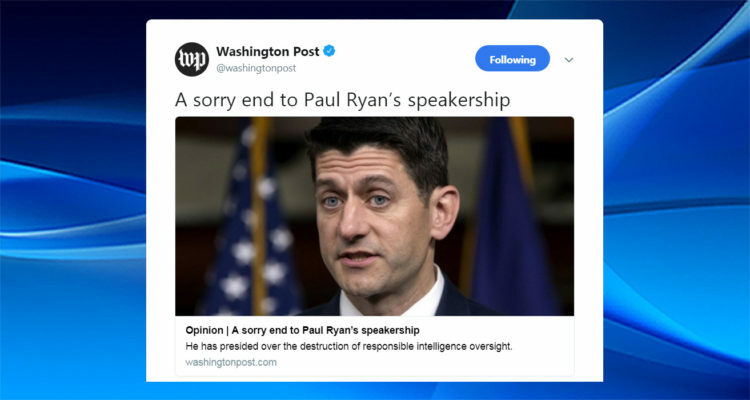 Jennifer Rubin wrote a fitting eulogy for Ryan’s reign that was published by The Washington Post on Sunday. House Speaker Paul D. Ryan’s last year in office is proving disastrous, a fitting end to the speakership of a man once considered a principled conservative reformer. His refusal to fulfill his constitutional role as leader of the House but rather play the role of presidential poodle and Republican attack dog for his increasingly unhinged caucus has had dire consequences for the GOP House majority, the intelligence oversight process and the broader conservative movement. Ryan’s legacy will be not only of someone who politically enabled an unfit president, but also of someone who presided over the erosion of trust required for a proper intelligence oversight process. Ryan has done his party no favors in permitting it to become irrational conspiratorialists and antagonists of our intelligence community. His passivity has only encouraged Trump to abuse his powers, which may, when the facts are laid bare, amount to obstruction of justice. He is no longer doing the people’s business — either to pass necessary, bipartisan legislation or to defend the people’s security. Perhaps he should retire now. Any temporary replacement could hardly do a worse job for the remaining months of the GOP majority.